Here Are Some Tips & Tricks for (Mac) OS X and GNU/Linux Nano Text Editor Including Shortcuts, Line Numbers, Going to Line Number etc. Basic Things. vi is definitely a powerful text editor, you can read How to Use vi Text Editor, but basically for the new Linux and OS X user, Nano appears better. It is better to help the user to shift from closed source software like Microsoft Windows in a smooth way. When Nano’s limitations will push them to use vi, they’ll definitely use vi. A human trying to ssh for the first time in life, if we instruct them to use vi, only the difficulty of using a text editor becomes the reason to fear ssh, honestly, that is not exactly what is called Free Software agonistic approach. These Nano Text Editor Tips & Tricks are possibly not for 100% new user, but can help many users in real life. 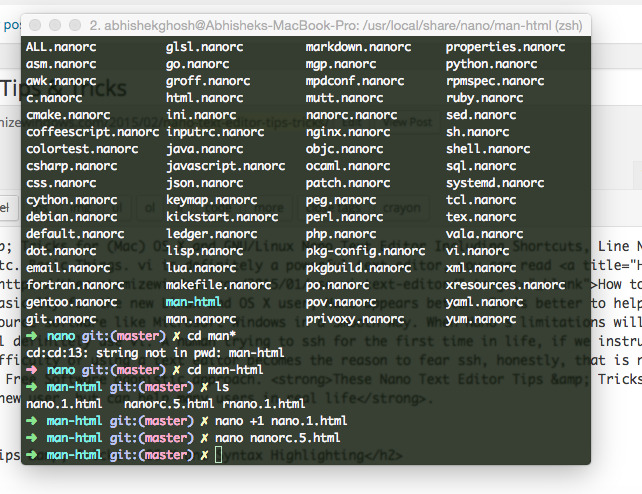 We are not mentioning more guides related to Syntax Highlighting for Nano. You can perform a search on this website later, if you want. Cite this article as: Abhishek Ghosh, "Nano Text Editor Tips & Tricks," in The Customize Windows, February 25, 2015, April 23, 2019, https://thecustomizewindows.com/2015/02/nano-text-editor-tips-tricks/.